In 2004, the Institute of Medicine (IOM) of the National Academy of Sciences completed a review of the available scientific literature pertaining to the health consequences of building dampness and mold . In 2009, the World Health Organization (WHO) completed a similar review . Both organizations concluded that presence of dampness and mold in homes was associated with increases in several respiratory health effects but that the specific dampness-related agents causing the increases in respiratory health effects were unknown. Since the completion of work by these two organizations, several new articles with reviews of the literature have been published. The key features and findings of these new reviews are summarized in Table 4. The detailed review by Mendell et al. found that indoor dampness or mold, determined visually or via mold odor, was associated with increases in asthma exacerbation, cough, wheeze, upper respiratory symptoms, asthma development, shortness of breath, ever diagnosed asthma, respiratory infections, bronchitis, allergic rhinitis, and eczema. These conclusions largely mirror those of the prior reviews by the IOM and WHO, except for the findings that dampness and mold were associated with asthma development (onset of new asthma as opposed to just exacerbation of existing asthma) and with increased respiratory infections and bronchitis. The IOM review, based on more limited data, had not concluded that dampness and mold were associated with asthma development, respiratory infections, or bronchitis. Mendell et al. also reported suggestive evidence of increases in common cold and atopy (allergic sensitization, i.e., having an IgE type response to allergens) with visible dampness and mold, suggestive evidence of increased wheeze with higher ergosterol (a mold marker) in dust, and suggestive evidence of increased wheeze with higher endotoxin (primarily a marker of bacteria) in dust. The review by Park and Cox-Ganser  considered evidence from studies of dampness and mold in workplaces as well as in homes and had similar conclusions but also summarized evidence that two relatively rare lung diseases - hypersensitivity pneumonitis and sarcoidosis - increase in buildings with dampness and mold problems. The review by Tischer et al. focused on children and concluded that visible mold and higher mold spore levels in homes were associated with increases in allergic respiratory health outcomes in children. Kanchongkittiphon et al. considered only asthma exacerbation as an outcome. They concluded that dampness and dampness-related agents were casually related to asthma exacerbation in children and associated with asthma exacerbation in adults. They also found limited evidence of associations of asthma exacerbation with higher indoor concentrations of total fungi or fungi of the Penicillium genus. The final row of Table 4 summarizes two papers that reviewed the health consequences of mold without an exclusive focus on the health risks of dampness and mold in buildings. Both articles find that there are relatively few health outcomes for which causal relationships between mold exposure and health has been proven. These few outcomes include mold infections and relatively rare lung diseases. These articles also indicate that there is minimal or no evidence of associations of mold with autoimmune diseases and sick building syndrome symptoms, although they do not provide a thorough discussion of associated data. At the time of the IOM's review, there were no published meta-analyses of the relationships of dampness and mold with health. Meta-analyses statistically combine the results of multiple studies to develop central estimates of relationships of risk factors with health outcomes. Meta-analyses enable the results of multiple studies to be combined in a structured manner. Compared to typical literature reviews such as those in Table 4, the findings of meta-analyses are less subject to qualitative judgements. Since the IOM's review, the results of eight meta-analyses of dampness and mold in homes have been published and the associated papers are summarized in Table 5. In this table, statistically-significant central estimates are highlighted in bold font. These meta-analyses have generally found increases in respiratory symptoms (e.g., cough, wheeze, allergic rhinitis) and asthma diagnosis associated with visible dampness and mold with odds ratios generally in the range of 1.4 to 1.8, implying roughly 40% to 80% increases in health outcomes in homes with dampness and mold. The meta-analyses include few statistically significant associations of health outcomes with levels of mold spores or with concentrations of chemical markers of mold. Surprising, Tischer et al. suggest a reduction in respiratory health effects associated with higher glucan levels (glucans are markers of fungi). The key results of the first of these meta analyses  are depicted in Figure 1. 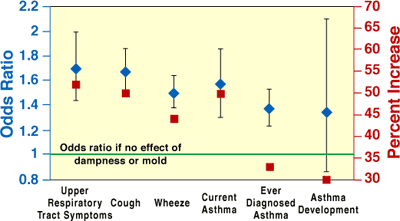 This figure shows statistically significant associations of dampness and mold in homes with respiratory tract symptoms, cough, wheeze, current asthma, and ever having a diagnosis of asthma. It was estimated that these health outcomes increase by 30% to 50% in homes with dampness and mold. This analysis found a non-statistically significant approximately 30% increase in asthma development with dampness and mold. At the time of the analysis, results were available from only four studies of asthma development. The subsequent meta-analysis of Tischer et al. also found small, approximately 10%, non-statistically-significant increases in development of asthma, when dampness and mold were present, except there was a statistically significant approximately 40% increase in asthma development for ages 0 - 2. However, the diagnosis of asthma can be uncertain in such young children. The various meta-analyses of Quansah et al. which focused explicitly on asthma development, was able to utilize the results of 8 to 16 studies. In these analyses, there were statistically significant 30% to 70% increases in asthma development with four out of five indicators of dampness and mold. Figure 1. Results of analyses to quantify the average increases in health effects for occupants residing in homes with dampness or mold . The second-listed meta-analysis of Fisk et al. 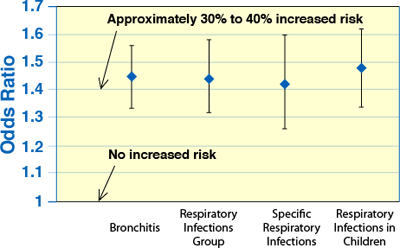 is the only one focusing on bronchitis and respiratory infections and the key results are shown in Figure 2. The analysis indicates statistically significant, approximately 30% to 40%, increases in bronchitis and various categories of respiratory infections among occupants of homes with dampness and mold. These analyses indicated statistically significant approximately 40% to 50% increases in bronchitis and various categories of respiratory infections in homes with dampness and mold. Figure 2. Results of analyses to quantify the average increases in respiratory infections and bronchitis for occupants residing in homes with dampness or mold . In summary, based on reviews of a large number of quality studies and based on meta-analyses of study findings, indoor dampness or mold, determined visually or via mold odor, is associated with increases in asthma exacerbation, cough, wheeze, upper respiratory symptoms, asthma development, shortness of breath, ever diagnosed asthma, respiratory infections, bronchitis, allergic rhinitis, and eczema. The odds ratios resulting from meta-analyses often indicate 30% to 70% increases in the prevalence rates of health effects in homes with dampness and mold. However, research has not clearly identified the specific dampness-related agents causing the increases in respiratory health effects.